You've been able to allow your entrants to 'enter someone else' (or several people) and to 'substitute someone else' (and optionally charge a fee for this) for some time. Now you can also let them transfer an entry to someone else's RiderHQ account. This is useful as it means that the person to whom it has transferred can check and edit their own entry details and (potentially!) upgrade their entry or substitute for a different person, if they need to. The feature is also optional - that is the entrant (or you as the administrator) can choose whether or not to transfer. Sometimes it doesn't make sense to transfer to a new account - for example if a husband was just substituting their wife, or vice versa it makes sense to keep the entry in the same account and not go to the bother of setting up a second account. Finally, you can't rely on people getting around to completing a transfer, so it's a good idea to keep the entry accessible in the orginal purchaser's account in the meantime, so they can edit it, if needs be. We offer the 'transfer' option on the 'entry details' screen and as a suggestion immediately after someone substitutes their entry for someone else. We send an email to the entrant who will be taking on the entry and once they click on it the entry is immediately transferred to them. 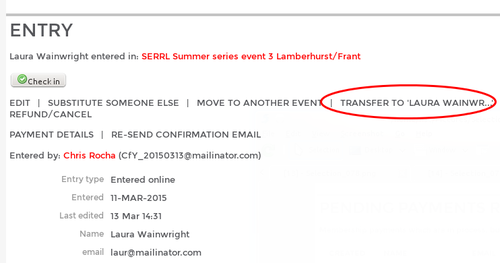 Organisers can also put a transfer request through from the 'entry details' screen.